Five young Jewish people, from New Orleans, the San Francisco area and Israel, took nonviolent direct action at a Jewish Federation Conference in New Orleans on Monday November 8, voicing dissent of Israeli state policies during Israeli Prime Minister Benjamin Netanyahu's address. "We would not have had to interrupt Netanyahu if the world listened to Palestinian voices"
...It shouldn't take this kind of action to draw attention to these crimes. The media should have cared this much about the dozens of Palestinians who marched outside the GA the day before Netanyahu arrived. Palestinian voices should be heard, respected, and reflected in all coverage of Palestine. The myriad examples of Palestinian nonviolence should be better known than those far fewer examples of violence that dominate Israel's security narrative. And Israel's violence should be known fully, and properly contextualized. Most of all, Palestinians should guide us in understanding how best to address the atrocities perpetrated against them. 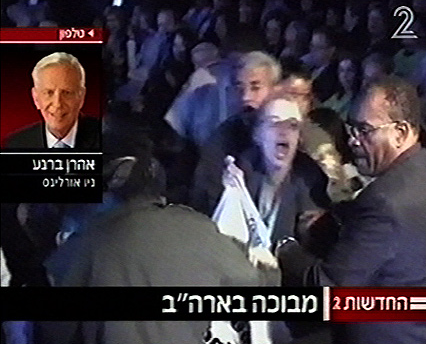 The photo is a Israeli TV News still of Ratner as she was escorted from Netanyahu's speech.